Use Scotts® Turf Builder® Southern Lawn food to build a strong, thick southern lawn that helps protect it from heat and drought. In Florida? 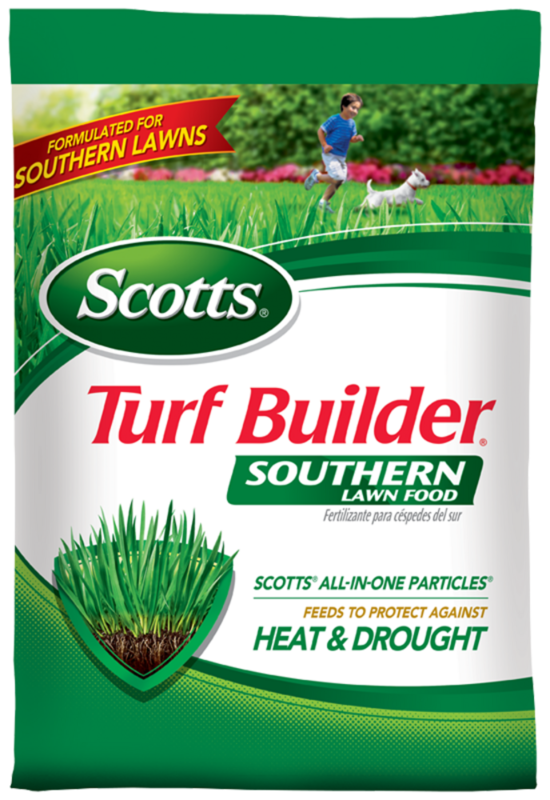 Use this version: Scotts® Turf Builder® Southern Lawn FoodF. 5,000 sq. ft., 10,000 sq. ft. and 15,000 sq. ft. Safe to use on any grass type. Apply to a wet or dry lawn on a calm day. For best results, use a Scotts® spreader. Apply only to actively growing turf. For even application walk at a steady pace slightly overlapping each pass. For fast results, lightly water in (product does not require watering in). Scotts Broadcast Spreaders: Line up each pass approximately 5 ft. from wheel track. Scotts Drop Spreaders: Align hopper arrow with previous wheel track. Apply this product only to your lawn and sweep any product that lands on the driveway, sidewalk, or street back onto your lawn. Return unused product to original container. Help keep our water clean. Do not apply near water, storm drains, or drainage ditches. Do not apply if heavy rain is expected. Lawn is safe to re-enter immediately after product is applied. Apply any season. Apply only to actively growing turf. Feed every 6-8 weeks for your best lawn with this or other Scotts lawn foods designed for your grass type. Florida Applications: 4 annual feedings with the following exceptions: On centipedegrass do not exceed 2 feedings in the north and 3 feedings in the central and south. On bahiagrass and zoysiagrass do not exceed 3 feedings in the north. Specially formulated for Southern lawns. Helps protect against heat and drought. Okay to re-enter lawn immediately after product is applied. We Care - Scotts products are designed with care to grow a thicker, greener lawn. A Green Lawn Is a Good Lawn - A healthy lawn cleans the air, produced oxygen and prevents runoff and soil erosion. You Can Make a Difference - Help keep our water resources clean. Apply this product only to your lawn, and sweep any product that lands on the driveway, sidewalk, or street back onto your lawn. Mow high and leave grass clippings on your lawn. Mowing high allows the grass to develop a deep root system & helps your lawn use water more effectively. Grass clippings recycle the plant nutrients back into the soil. Dry fertilizer products (without pesticide controls) have an indefinite shelf life. Feed every 6-8 weeks for your best lawn with this or other Scotts lawn foods designed for your lawn. For faster results, lightly water in (product does not require watering in). Well-fed lawns are more efficient at using available water. Feeding with Scotts products helps grow a thick lawn with more roots to better absorb water and nutrients than an unfed lawn. This protects your lawn against heat, drought and other stresses. Remember, your lawn will begin to wilt when water is needed. As much as possible take advantage of nature's sprinkler and rely on the rain to water your lawn.